The capital cities of the former kingdom of Arakan, may be devided into two groups: one group comprising those cities situated in the Kaladan Valley and the other, those of the Lemro Valley. Mrauk- Oo (Mrohaung), the last of the Royal Capitals of Arakan is unique, because it occupies a narrow valley in the hills between the Lemro and the Kaladan rivers. Commanding the only big gap between the two valleys, the city exerted control over both those valleys which were easily accessible by means of streams and roads. However, since our present concern is with the Arakan of the period before 1000 A.D., we shall be dealing only with the cities of the Kaladan Valley. Of these, the most important by far are the cities of Dhanyawadi and Vesali, both located just west of the ridge which lies between the Kaladan and the Lemro rivers. The sites of these cities are about 16 miles apart, but both were built on the welldrained foothill area of the ridge, with their backs against the ridge. As a matter of fact, the eastern wall of Vesali is built on the ridge itself. The ridge is 1200 feet high behind Dhanyawadi, but decreases in height towards the south. Behind Vesali it is 400 feet high. Dhanyawadi (Lat, 20˚ 52' N., Long 93˚ 3' E.) is located 6 miles east of the Kaladan river, and about 60 miles up-river from its mouth at Akyab. The city site is about 16 miles north of Vesali, and some 21 miles north of Mrauk-Oo (Mrohaung). See Map III. The city is backed up against the ridge which separates the Kaladan valley from the Lemro valley. The remains show that there was an outer and an inner city. Parts of the walls and the moats can still be seen in many places. The modern village of Thayettabin lies in the southwestern part of the outer city, and the Mahamuni Shrine lies in the southwestern of the inner city. See picture. Go The old city was of fairly of the ridge. On the western side only a small portion of the outer tributary of the Kaladan. The chaung may have once formed the moat on the west. The remaining parts of the former moat have been silted over and have become paddy fields. The inner city was the site of the Palace. Royalty and officialdom resided within the inner city. The common people occupied the outer city whose walls also enclosed the fields which they cultivated. The area of the inner city was only 64 acres. In those days of insecurity, when the country was often subject to raids by various hill tribes, the people felt safer within the walls. By enclosing the paddy fields, the people would have an assured food supply even under siege, thus permitting them to withstand the siege. Dhanyawadi was built at a time when only the upper Kaladan was above high water level. To the south, below the latitude of Mrauk-Oo (Mrohaung), the country was still one vast area of mangrove swamps. Only the edges of the islands were then reclaimed for cultivation. Small sailing ships could come right up the Thare Chaung to the city. Indian influences penetrated into the city by sea and by land. According to local chronicles, this Dhanyawadi is the third Dhanyawadi I have mentioned in Chapter II, and it is supposed to have been the Capital of Arakan from the 6th century B.C. to 788 A.D. Dr. E.H. Jonston. 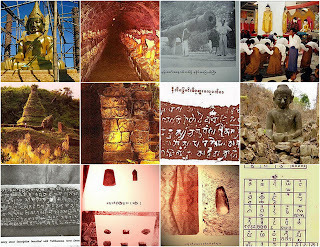 however, after deciphering Anandacandra inscription of Shitthaung Pagoda which is situated in Mrauk-Oo, dated the founding of Vesali as 350 A.D. Dr. Sircar of the Indian Archaeoligical Survey also aggress with Dr. Johnston, in differing from the local chronicles, and he has suggested the date of the founding of Vesali to be about 370 A.D. If we are to accept these dates, then Dhanyawadi was the Capital of Arakan up to 350 or 370 A.D.
Dhanyawadi controlled the Kaladan Valley and also the Mayu Valley on the west. At that time the Lemro had probably not as yet was then in all probability occupited by hill tribes. Even in the lower Lemro valley, the flood plain was mainly to be found on the western side, the hills reaching the river along most of the eastern bank. Vesali (Lat: 20˚ 40' N. Long. 93˚ 9'E.) lies 16 miles south of Dhanyawadi. See Map III. It has on its western flank the Rann Chaung a tributary of the Kaladan, and on its eastern side, the ridge which separates the Kaladan Valley from the Lemro Valley. The shape of the city is rather unusual since the walls were built in such a way as to obtain the fullest advantage of the well-drained land to be found in the foothill zone. The shape is somewhat oval, the north and east running in more or less straight lines, while the walls on the south and the west are curved. See Map V and Plate 8. A tributary of the Rann chaung now traverses the city site. According to the local chronicles, the city's full name is “Vesali, the city with the stone stairs”. These stone stairs led to the pier where sailing ships must have docked in those days. Remains of those stone stairs leading to the pier can still be seen at ebb-tide, on the northwest of the city. The north-south diameter of the outer walls at the widest part is nearly 10,000 feet, while the east-west diameter is only about 6,500 feet at the widest. The area of the city is about 2.7 square miles, very definitely larger then Dhanyawadi. Like Dhanyawadi, Vesali also has a smaller inner city: the palace site. It is rectangular in shape with a length of 1500 feet and a width of 1000 feet. A moat surrounds the walls of this inner city. Vesali, a bigger city, was even more secure then Dhanyawadi with the population tilling their fields inside the city walls. It is noteworthy that Vesali, lying further south, was even more open to western influence. According to local chronicles, Vesali was the capital of Arakan from 788 to 957 A.D. when conditions became unsettled. Actually it continued as the capital till 1018 A.D. under those unsettled conditions. According to Johnston and Sircar, Vesali was founded even earlier then the date given in the local chronicles; they give the date as 350 or 370 A.D. In any case, Vesali was a larger and more thriving port than Dhanyawadi. Both the cities of Dhanyawadi and Vesadi being built on the well-drained foothill area of the ridge which lies between the Kaladan and the Lemro rivers, are well preserved from the ravages of the rivers. Many and varied antique pieces have been found from these two places from time to time. 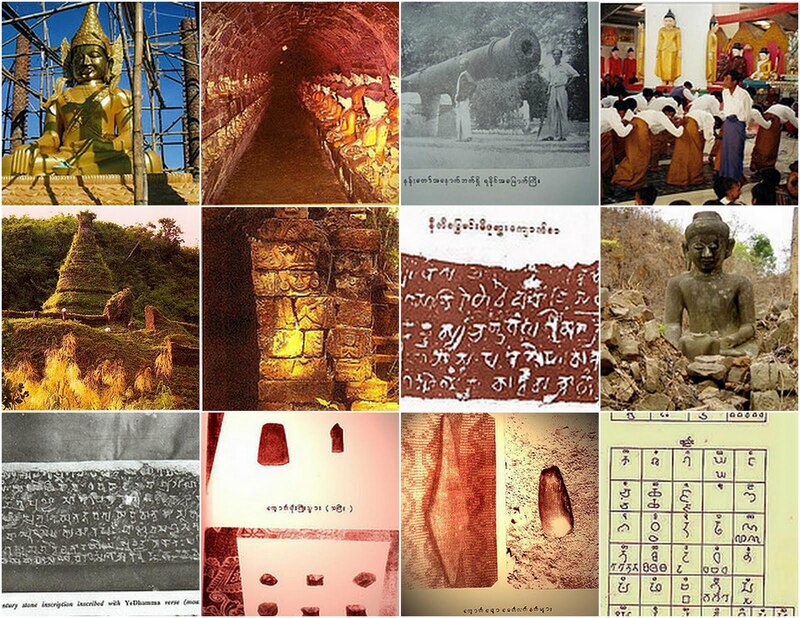 Systematic excavation of these images shown in this book were obtained from the relic chambers of ruined pagodas situated in these places.